Giles Pettibone was born in 1760. He was the son of Col. Giles Pettibone and Margaret Holcombe. Giles Pettibone died in 1811. Cephus Pettibone was born in 1763. He was the son of Col. Giles Pettibone and Margaret Holcombe. Augustus Pettibone married Sarah Lawrence. Augustus Pettibone was born in 1766. He was the son of Col. Giles Pettibone and Margaret Holcombe. Sarah Lawrence married Augustus Pettibone, son of Col. Giles Pettibone and Margaret Holcombe. Levi Pettibone was born on 17 December 1780. He was the son of Col. Giles Pettibone and Margaret Holcombe. Levi Pettibone married Martha Lowry in 1831. Levi Pettibone died on 24 June 1881 at age 100. [S104] DAR DAR Lineage book, Vol. LXII:Pg. 67/Item 61190. [S129] Unknown author, "Supplemental Application 61190." Martha Lowry married Levi Pettibone, son of Col. Giles Pettibone and Margaret Holcombe, in 1831. Martha Lowry died in 1845. Lucy Pettibone married Augustus Phelps. Lucy Pettibone was born in 1787. She was the daughter of Col. Giles Pettibone and Margaret Holcombe. Augustus Phelps married Lucy Pettibone, daughter of Col. Giles Pettibone and Margaret Holcombe. Augustus Phelps was born in April 1781 at Simsbury, Hartford Co., CT. He died on 22 December 1860 at Norfolk, Litchfield Co., CT, at age 79. Jonathan's grave stone gives birth as 8 Oct 1782, Town Records as 7 Nov 1783. He was recorded in the 1850 census of Granby as a farmer, owning real estate, $3,500. [S25] Hannah McPherson, Holcombe Genealogy, Page 189.1/Item A-8-1-10-5-2. [S66] Mark Williams Granby VR, Page 253. Sereno and Ann were enumerated in the 1850 Granby, Hartford Co., CT federal census. He was a farmer, age 64, she was 62. Also in the household was Jane, age 28. Sereno and "Alma" are enumerated in the 1860 Granby, Hartford Co., CT, census with a "Lyman?" or "Symon?" Holcombe, age 17, born in Ohio. [S25] Hannah McPherson, Holcombe Genealogy, Page 189.2/Item A-8-1-10-5-3. [S65] Deanna Holcomb Bowman Thomas Holcomb, Vol. 2:Pg. 127/Item 81042. Anna Clements was also known as Anna Clemons.1 She married Harlow Holcombe, son of Noadiah Norman Holcombe and Affiah Buttolph.2 Anna Clements married Sereno Holcombe, son of Noadiah Norman Holcombe and Affiah Buttolph. Lucy Thompkins was the daughter of Gilbert Thompkins. Lucy Thompkins married Chester Holcombe, son of Jacob Holcombe and Theodocia Bacon. Orator and "Sirena" were enumerated in the 1850 Granby, Hartford Co., CT census with Chauncey age 20, Electa age 17, and Burt 12. Orator and Cyrena were enumerated in the 1860 Granby, Hartford Co., CT, census. Orator and Cyrena were enumerated in the 1870 Granby, Hartford Co., CT, census. [S65] Deanna Holcomb Bowman Thomas Holcomb, Vol. II:Pg. 129/Item 810a2. [S23] Jesse Seaver, The Holcomb(e) Genealogy, Page 63. [S25] Hannah McPherson, Holcombe Genealogy, Page 192.2/Item A-8-1-10-13-2. [S161] Carol A. Laun, Granby Center Cemetery, Page 77. Nelson Reed was born circa 1799. 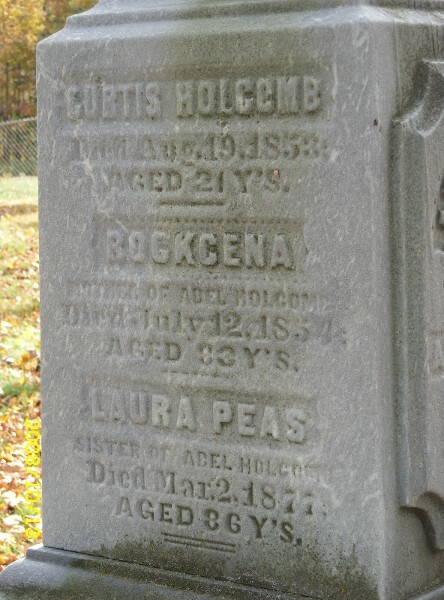 He married Theodocia Holcombe, daughter of Jacob Holcombe and Theodocia Bacon, on 19 March 1817 at Granby, Hartford Co., CT. Nelson Reed died on 8 September 1836. A farmer near Barn Door Hills, Granby, CT.
Chauncey and Alma were enumerated in the 1850 Granby, Hartford Co., CT census. Alonzo age 18, Lucia age 15, a female age 13, Samantha age 9, and Mary age 6 were in the household as was Mary Nability(?) age 19. Chauncey and Alma were enumerated in the 1860 Granby, Hartford Co., CT, census. Alonzo, Samantha, Mary, and Isadore were in the household. Chauncey and Alma were enumerated in the 1870 Granby, Hartford Co., CT census. Isadore was in the household along with three farm laborers. Chauncey and Alma were enumerated in the 1880 Granby, Hartford Co., CT, census. There were two hired help in the house but no children. Alonzo lived next door. [S97] Seth P. Holcombe, Descendants of Hull Holcomb, Page 5/item 2. [S127] Unknown author, "Supplemental Application 244184." [S178] Christina Bailey and Lorraine Cook White, Barbour: Granby, Pages 101, 114. [S422] Jr. Winfred R. Goddard, Goddard, Page 77. [S178] Christina Bailey and Lorraine Cook White, Barbour: Granby, Pages 114, 118. [S97] Seth P. Holcombe, Descendants of Hull Holcomb, Pages 5-6/Item 2. [S104] DAR DAR Lineage book, Vol. LIX:Pg. 201/Item 58587. Pliny Holcombe was born on 15 April 1803. He was the son of Jacob Holcombe and Theodocia Bacon. Pliny Holcombe died on 3 January 1804. [S25] Hannah McPherson, Holcombe Genealogy, Page 193.1/Item A-8-1-10-13-5. [S137] Elisha Scott Loomis, Joseph Loomis, Page 452, Item 9355. Sylvester and Sarah were enumerated in the 1860 Granby, Hartford Co., CT, census with Wilbur and an unnamed son, age 6 mos. There is a Charles R. Holcomb, age 58, in the 1870 Granby, Hartford Co., CT, federal census, page 1. Schuyler Holcombe was born in 1820. 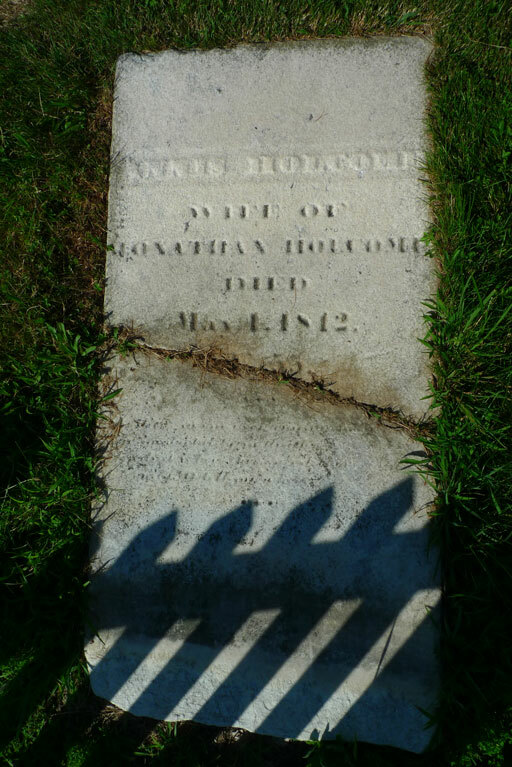 He was the son of Jacob Holcombe and Susannah Rowe. The 1850 Granby, Hartford Co., CT census has a Schuyler Holcombe as head of household, a carpenter age 30. A "Delura Holcombe" is also in the household along with Jason E. Case a farmer age 30 and Almira Case (Almira Dency Holcombe), age 23. [S807] Find A Grave, online http://www.findagrave.com, memorial Id # 29221685. [S66] Mark Williams Granby VR, Page 252. [S178] Christina Bailey and Lorraine Cook White, Barbour: Granby. Sylvia Holcombe was born in 1790. She was the daughter of Abel Holcombe. Sarah Holcombe was born on 1 January 1791 at Granby, Hartford Co., CT.1 She was the daughter of Abel Holcombe and Roxanne Higley. James Henry Holcombe was born in 1796 at Granby, Hartford Co., CT.1 He was the son of Abel Holcombe and Roxanne Higley. "Abell" and Amanda were enumerated in the 1850 Westfield, Chautauqua Co., NY, federal census. He was a farmer age 42. She was 45. Children in the household were Helen A. 23, Curtis E. 18, Albert 16, Annis 13, Jane 12, Charles 10, Theodosia 8, George 6, and Porter 20. Abel and Amanda were enumerated in the 1855 Westfield, Chautauqua Co., NY, state census. He was 47. Childlren in the household were daughter Helen Wood 27, Alice 17, Albert 21 Charles 15, Theodosia 13, George 11, and grandson Lawrence A. Wood 0. Abel and Amanda were enumerated in the 1860 Westfield, Chautauqua Co., NY federal census. He was 52, she was 55. Also in the household were Charles 20, Theodosia 18, George 16, Helen Wood 31, Lawrence Wood 5, and Ella Bell Wood 1. Abel and Amanda were enumerated in the 1865 Westfield, Chautauqua Co., NY, state census. he was 58, she was 60. Also in the household were George 21, Helen Wood 37, Lawrence Wood 10, Ella Wood 6, Laura Peas 74, and Nelson Porter 30. Abel and wife Helen were enumerated in the 1880 Westfield, Chautauqua Co., NY, federal census. He was 72. Also listed was daughter Helen Woods, perhaps Helen's daughter from a previous marriage? [S25] Hannah McPherson, Holcombe Genealogy, Page 193.2/Item A-8-1-10-14-8. [S807] Find A Grave, online http://www.findagrave.com, memorial Id # 159462305. [S807] Find A Grave, online http://www.findagrave.com, memorial Id # 159462506. Noadiah Norman Holcombe was born say 1800. He was the son of Noadiah Norman Holcombe and Mary Loomis. Noadiah Norman Holcombe died on 14 March 1873. He was buried at Old Marcellus Village Cemetery, Marcellus, Onondaga Co., NY. N.N. was enumerated in the 1860 Marcellus, Onondaga Co., NY, federal census. He was a farmer, age 59. Also in the household was Russell L. 57, Justin 55, Molly 82, and 3 domestics/laborers. Noadiah was enumerated in the 1865 New York Census. In the household were his brother Jason Noadiah and wife Betsy A. and their children, and mother Molly, age 87. Noadiah was enumerated in the 1870 Marcellus, Onondaga Co., NY federal census, page 13. He was a farmer, age 69. Also in the household were brothers Russell 67, and Justin H. 65, and three laborers and servants. Justin H. Holcombe was born say 1804. He was the son of Noadiah Norman Holcombe and Mary Loomis. Justin H. Holcombe died on 15 September 1890. He was buried at Old Marcellus Village Cemetery, Marcellus, Onondaga Co., NY. Russell L. Holcombe was born say 1802. He was the son of Noadiah Norman Holcombe and Mary Loomis. Russell L. Holcombe died on 12 September 1878. He was buried at Old Marcellus Village Cemetery, Marcellus, Onondaga Co., NY. Isaac C. Holcombe was born say 1810. He was the son of Noadiah Norman Holcombe and Mary Loomis. 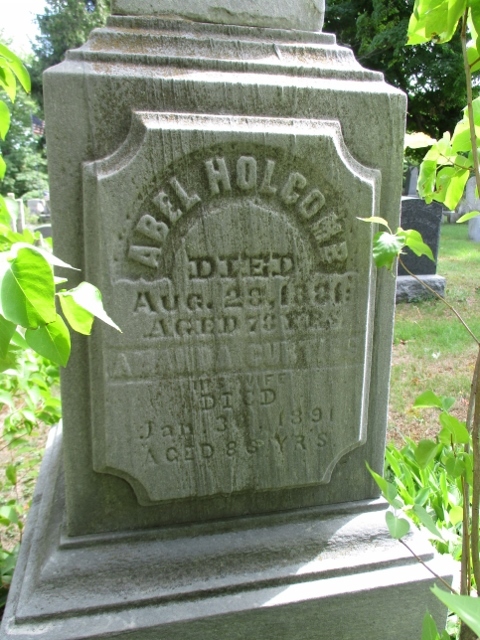 Isaac C. Holcombe died on 16 June 1857; killed by R.R. cars. He was buried at Old Marcellus Village Cemetery, Marcellus, Onondaga Co., NY. Jason and Betsy were enumerated in the 1855 NY State Census in the household of his borhter Noadiah. He was 45, she was 55. Mary D. Holcombe was the daughter of Noadiah Norman Holcombe and Mary Loomis. Clarissa B. Holcombe was the daughter of Noadiah Norman Holcombe and Mary Loomis.